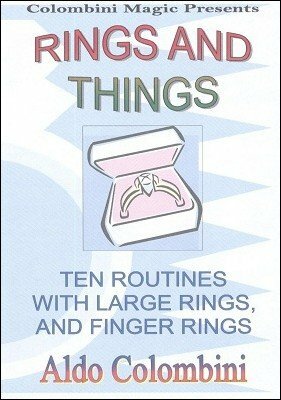 Ten routines with large rings and finger rings. All effects are performed with rings and other props such as silks, ropes, padlocks and pens. They are suitable for close-up and walk-around magic, and most are impromptu and can be performed with borrowed objects. RING ON STICK (Bill Simon): A finger ring escapes from a handkerchief and reappears on a stick or a pen. PICK A FINGER (Ken de Courcy): The perfect opening for a ring routine. You show your hand empty, a spectator picks a finger and on that finger a ring suddenly appears. DIRECT RING/ROPE PENETRATION (Michael Sondermeyer): A ring visibly penetrates a length of rope. THE PURLOINED RING (Meir Yedid): A finger ring placed inside a purse frame, disappears. You will be fooled by the method. RING-ON-ROPE TOSS (Doug Edwards): A large plastic ring is tossed towards the middle of the rope and penetrates it. RING ON RIBBON (Marconick): A reputation maker. A finger ring placed in a jewel box vanishes and reappears on a tied ribbon. ROPE, RING AND ROD (Jim Ryan): A finger ring is threaded on a rope, it vanishes and reappears on a pencil held by a spectator. KARATE IT ON (Sam Schwartz): The ring is held away from the ends of the rope. A karate chop and instantly the ring is on the rope. ON-OFF AGAIN (Oscar Weigle-Sol Stone): A finger ring and a pen are used. The ring penetrates on and off the pen. A solid impromptu routine. COMBINATION LOCK & RING (Paul Hallas): A borrowed ring is placed on a combination lock, a spectator discovers the combination using a deck of playing cards.